Which version to choose 2.x or 3.x? There are some key issues that may require you to use Python 2 rather than Python 3. Secondly, if you want to use a specific third party package or utility that doesn’t yet have a released version that is compatible with Python 3, and porting that package is a non-trivial task, you may choose to use Python 2 in order to retain access to that package. Another minor downsides for Python 3.x is, slightly worse library support. I recommend Python 2.7 because it has the most compatible packages. 1.Visit www.python.org and navigate to Downloads > Windows and click Python 2.7.9. 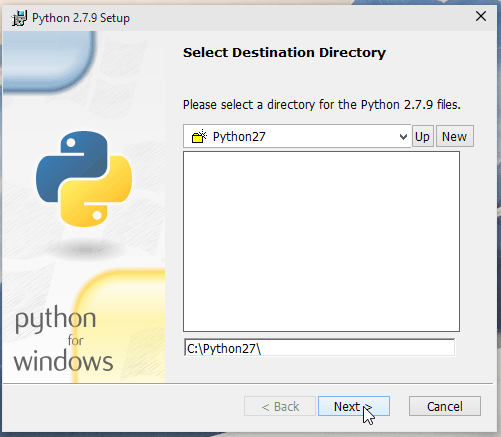 2. select Download Python 2.7.9 from options. 3. 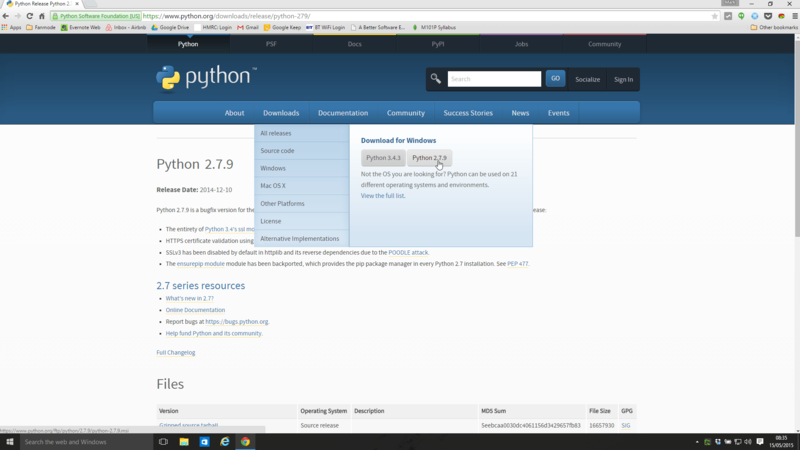 Wait for the Python installer to download, and then double click on it. 4. 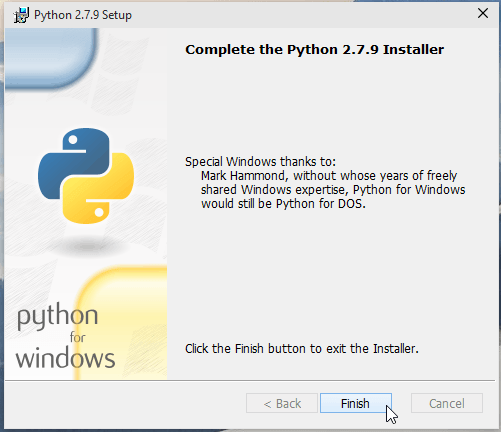 The Python Windows Installer will launch. 5. 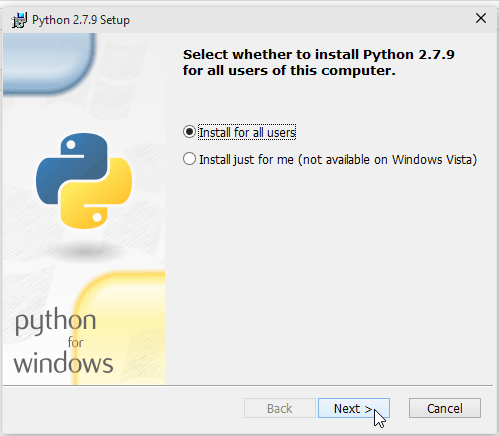 In the Python Setup screen, select Install for all users and click Next >. 7. 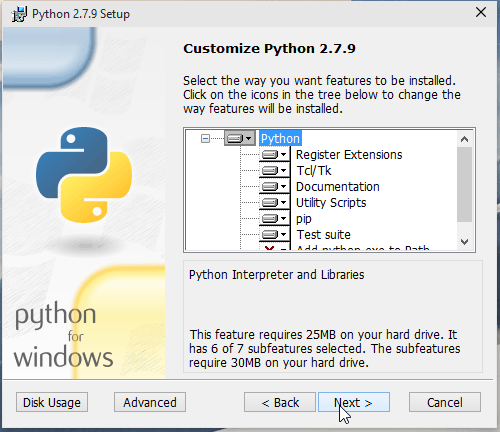 Leave the Customize Python 2.7.9 screen as default and select Next >. 8. Wait for the installation to complete. 9. Once the installation completes, click Finish. 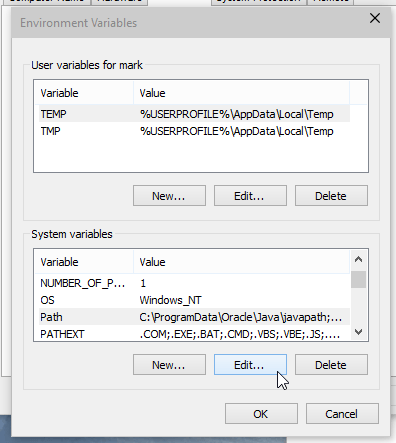 Setting up Environmental variable for Python. Now we need to add Python to the environment variables. 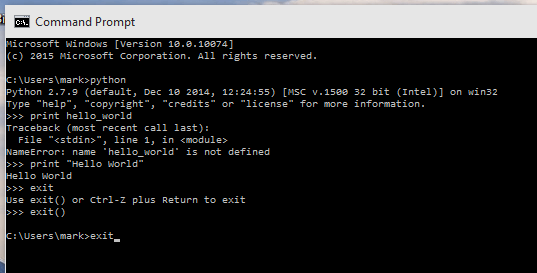 This means when you type “python” into the Windows Command Prompt window (CMD), it will start Python. 10. 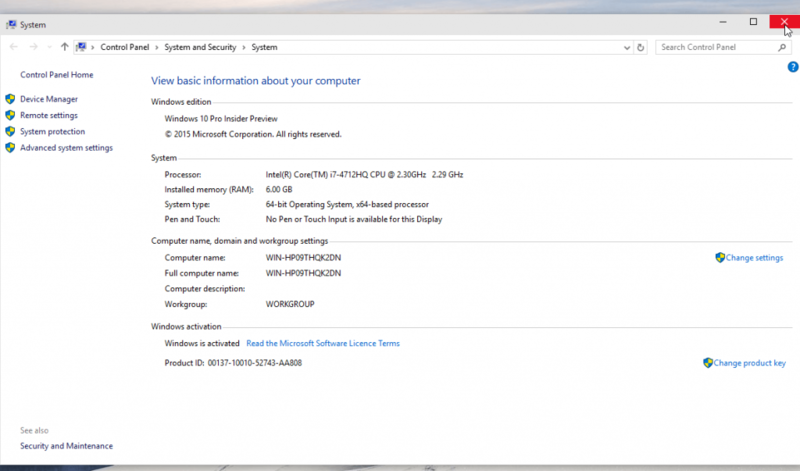 Right click the Start Menu in the bottom left and select System to load the System menu. 11. 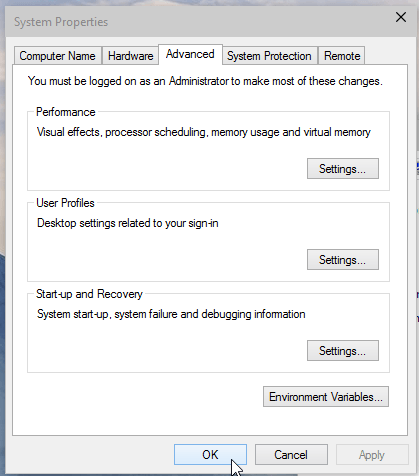 In the System menu, click on Advanced system settings. 14. 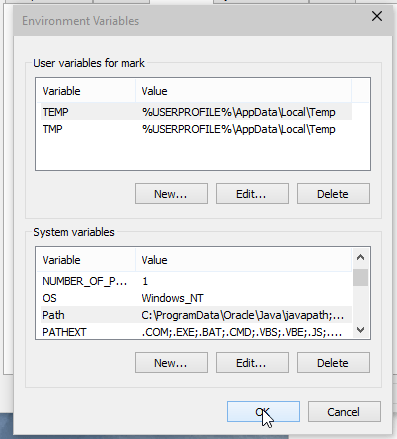 Being careful to leave the existing values intact, navigate to the end of the Variable value text box. Then append “;C:\Python27\” to the end (without quotes). 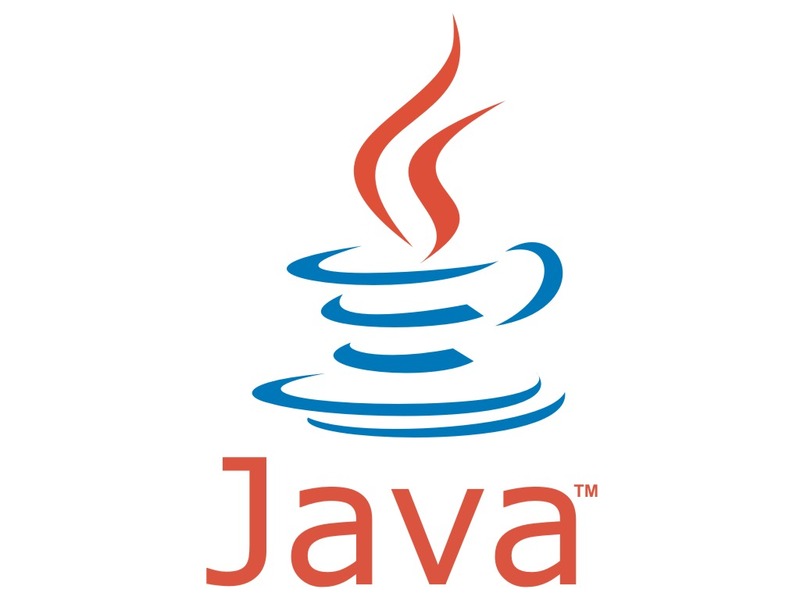 The semicolon is used to separate the variables. Then click OK to save the update. 15. Then click OK on the Environment Variables screen. 16. 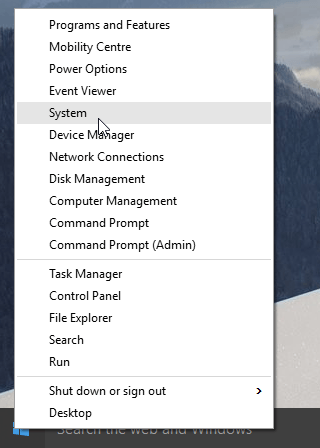 Click OK on the System Properties screen. 18. 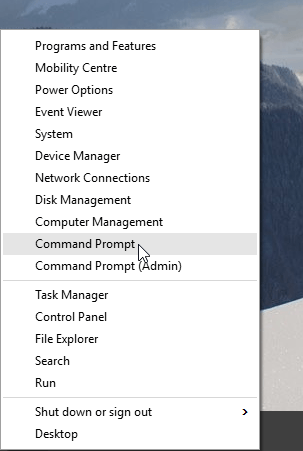 Now left click the start menu again and choose Command Prompt to load a new Command Prompt window. 19. 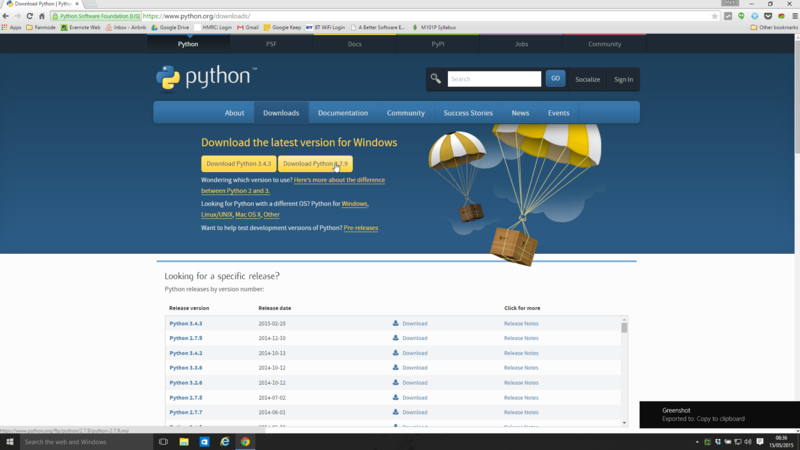 Now enter “python” into the window and hit Enter. 19. If you type print “hello world” it should output “Hello World” on the screen. Python has been successfully installed.